This bread rocks! Great crumb, tender on the inside, with the sweetness of golden raisins and nuttiness of the walnuts. Can be eaten alone, or as almost a dessert. 1) In a medium container (I use a food storage container with a snap on lid) whisk together the flours, salt, and yeast. Add the walnuts, raisins. and water using a large sturdy spoon to mix until you have a wet, stick dough, about 30 seconds. 2) Let sit for 20 minutes. Then sprinkle on the cinnamon. Knead it a bit to give the dough a nice marbled look. 3) Cover the container and let sit at room temperature for about 18 to 24 hours, until the top of the dough is dotted with bubbles and the dough has more than doubled in size. 4) Generously dust a work surface and scrape out the dough as one piece with a spatula or scrapper. Hold the dough in your hands and curl the edges under, stretching the top. Seal the bottom a bit, sit this down on a floured or, as I prefer, wheat germ sprinkled couche or tea towel, seam side down. 5) Push any raisins that are exposed back into the dough back into it (they'll burn otherwise) and sprinkle with wheat germ. Cover with the couche or towel and let rise in a warm draft free spot until doubled in size, about 1-2 hours. The dough is ready when a gentle poke with a finger leaves and impression. If it springs back test it again in 15 minutes. 6) MEANWHILE: about 30 minutes before the dough is ready turn the oven on to 475°F with the rack positioned in the lower third of the oven. Place a 4½- to 5½-quart Dutch oven with it's lid on the rack so everything is up to temperature when the dough is added. CAUTION: if your Dutch oven has a silicon, or non-metalic knob on top, there's a good chance these temperatures will ruin it. Some stores sell metalic knobs depending on your manufacturer. 7) When the oven and pot are heated and the dough is ready carefully remove the Dutch oven with pot holders. Take the lid off and carefully invert the dough into the pot so the seam is now up. Immediately close the lid and return to the oven for 30 minutes of baking. 8) Remove the lid and bake until chestnut brown. Internal temperature should be about 195°F, 15 to 30 minutes more. 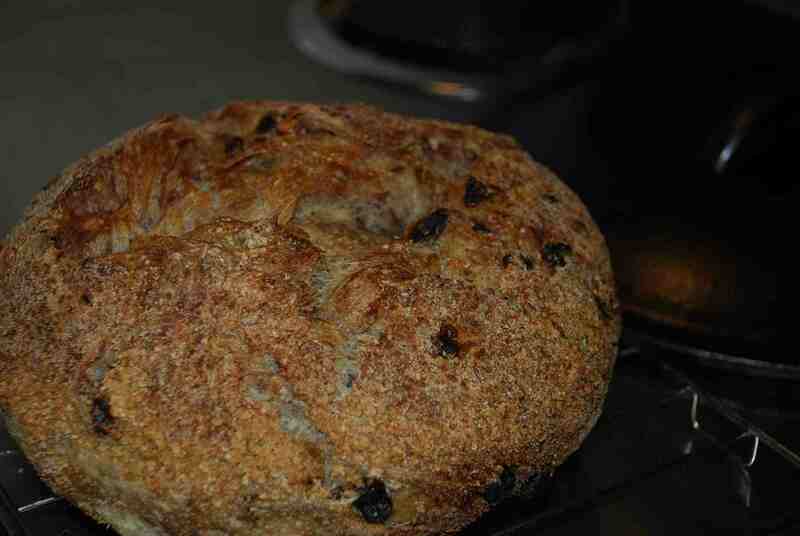 9) Carefully remove the dutch oven and, using tools such as a wooden spoon or potholders, remove the bread. Place it on a rack, enjoy the cracking sound of it cooling, and let it cool completely. Based on My Bread by Jim Lahey.